Adlai Stein is the owner of Macabee Metals and Central Ohio School of Metalwork. Macabee Metals makes products and art for sale at art fairs and on line, while Central Ohio School of Metalwork teaches the craft of blacksmithing. Adlai discovered blacksmithing in 1990 and he has been learning and forging ever since. Over the years he has created a variety of art, tools, knives and ornamental fixtures. Adlai’s love of heroic myths and legends, as well as fantasy novels, made blacksmithing a very attractive outlet for his creativity. He did not have a lot of tool skills when he was introduced to blacksmithing at a medieval reenactment event. After lots of work and practice, he was able to develop those skills. 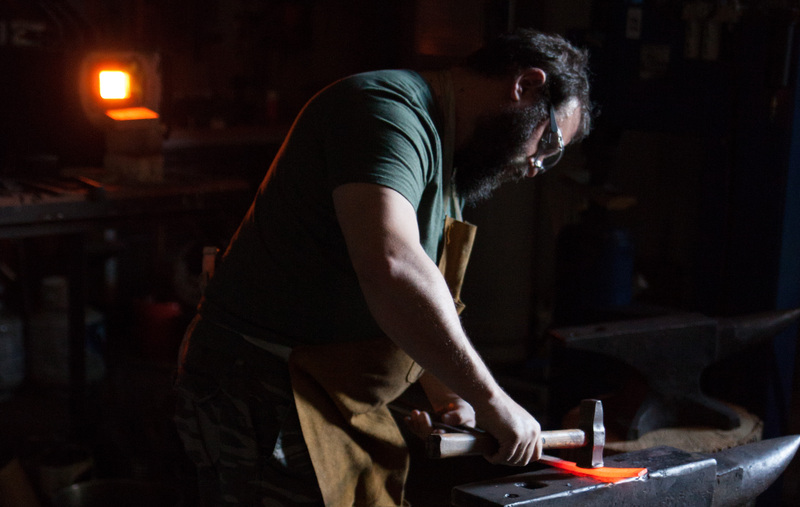 Adlai loves teaching blacksmithing to others as a way of paying it forward for all the people that taught and helped him get to where he is today. This love led him to be a founding member and the first instructor at the Idea Foundry. Adlai competed on History Channel’s Forged in Fire (Season 3, episode 13). The popularity of the show inspired him to teach more and open Central Ohio School of Metalwork. Adlai recently moved Macabee Metals from its home at the Idea Foundry to its new location in Franklinton, along with the newly formed educational branch, Central Ohio School of Metalwork.